In the world of scrambled eggs, soft-scrambled eggs are the king of the breakfast table. Creamy, comforting and yet luxurious, you can pile it on a toast while you’re rushing out of the door or toss in some cheese, bacon and the works if you have time to spare. It’s such a fundamentally simple dish, that an explanation may seem almost absurd. Anybody can scramble an egg but making a dreamy scramble is an art form. 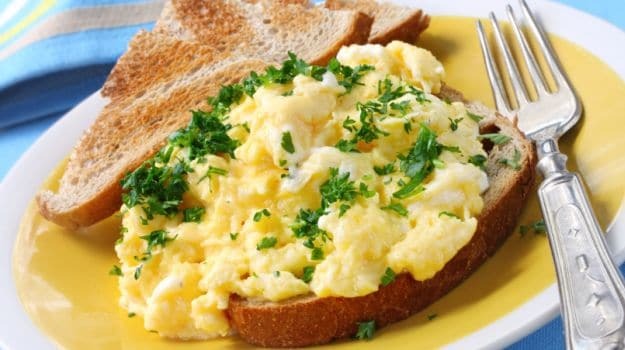 It’s the first dish most amateur cooks learn to master, and the biggest mistake most people make while cooking scrambled eggs is to add the salt after, or perhaps wonder whether to use milk or cream. So we’re here to clear your queries and give you a foolproof recipe. It’s time to bid dry, spongey eggs goodbye. 1. Avoid using a cast iron skillet while scrambling eggs because they turn a greenish shade. This is due to the sulfur in egg whites reacting with the iron of the pan. 2. The key to making perfectly scrambled eggs lies in whisking the eggs thoroughly beforecooking them, since whisking incorporates air and gives you fluffier scrambled eggs. 3. Contrary to popular belief, salting eggs in advance does not result in watery or tough scrambled eggs. Yes, eggs turn a darker shade of orange and appear thinner than before after adding salt but after testing and re-testing, I’ve found that pre-salting actually helps the eggs retain their moisture and tenderness. 4. Confused between milk and cream? Me too! So I thought it would be fun to make batches with cream and milk. I found that the scrambled eggs made with cream were a little too rich but the scrambled eggs made with milk were light and fluffy, and just rich enough. 5. Turn off the heat before the eggs are completely cooked since the heat retained in the pan continues to cook and firm up the eggs even after the pan is removed from heat. And the longer they cook, the drier they become. 6. The duration for which you beat the egg mixture is a matter of preference. So if you like your scrambled eggs dense, beat lightly. But if you prefer lighter fluffier scrambled eggs, beat vigorously. 1. Lightly beat the eggs, and then beat again with milk and a pinch salt and pepper in a bowl until blended. 2. Heat the butter in a large non-stick skillet over medium heat until hot, and pour in the egg mixture. 3. As the eggs begin to set, gently pull the eggs across the pan with a spatula, forming large soft curds. Continue cooking – pulling, lifting and folding eggs – until thickened. Note: No visible liquid egg should remain and you must not stir constantly. Voila, your scrambled eggs are ready. If you’ve mastered the ideal scrambled eggs and want to experiment with flavours, we’re here to help. You should only add anything additional near the end, just before the eggs are done so the add-ins can warm up or melt without interfering with the eggs. However, vegetables such as mushrooms should be cooked first, so that they’ve already released their water and are fully cooked through. You can also add a few sprigs of fresh soft herbs, red chilli (deseeded and finely chopped) for an Indian tadka. You can also stir a bit of creamy (dreamy) salad dressing or pasta or salsa into the egg mixture. For added flavour, I love adding shredded cheese, avocado and salmon.